I was not able to attend JavaOne 2016 and so am happy to see numerous resources online that allow me to make observations based on JavaOne 2016 content. I reference and briefly describe some of these JavaOne 2016 resources in this post and add some of my own observations based on use of those resources. These resources are useful to those of us who were, as Katharine has stated in JavaOne roundup, "unlucky enough to be stuck at home or work." If time constraints allow it, the best source of information available online is often the presentations themselves. Select JavaOne 2016 presentations are available on YouTube and the keynotes are available On Demand. Summaries of the sessions that were streamed live can be found in the posts JavaOne Live Streaming Day 1 (September 19), JavaOne Live Streaming Day 2 (September 20), JavaOne Live Streaming Day 3 (September 21), and JavaOne Live Streaming Day 4 (September 22). The JavaOne Conference Twitter feed, @JavaOneConf, provides numerous photographs and links to more details about events, sessions, and activities of JavaOne 2016. Besides the live streaming posts, The Java Source Blog also provides brief posts representing JavaOne 2016 "Highlights" for each day: Monday, Tuesday, and Wednesday. NetBeans Community Day at JavaOne 2016 Conference was on Sunday, September 18. Mark Stephens has written a nice summary of the first two sessions of NetBeans Day 2016. Geertjan Wielenga has written about James Gosling on NetBeans and Apache. David R. Heffelfinger's The Coolest things I"ve seen at JavaOne 2016 so far reviews "several sessions showcasing NetBeans capabilities." A post written before NetBeans Community Day about that day also describes the scheduled presentations. Josh Juneau's post JavaOne 2016 Follow-Up provides an overview of the entire conference with significant coverage of NetBeans Community Day. 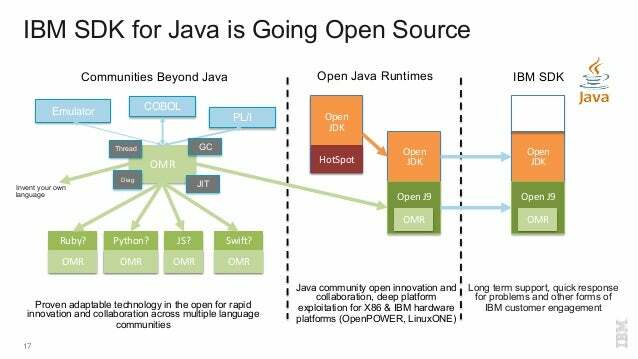 JaxEnter's JavaOne 2016: "Java 9 will be coming soon - but not as soon as you'd probably hoped"
Katharine's post JavaOne Community Keynote: IBM to open source Java SDK highlights arguably the biggest announcement at the Community Keynote: the IBM SDK for Java is Going Open Source (slides). Monica Beckwith's InfoQ post JavaOne 2016: IBM's Keynote – Accelerating Innovation with Java provides another overview of the IBM portion of the Community Keynote "Accelerating Innovation with Java: The Future is Today." Several sessions of JavaOne 2016 were recorded, were reviewed, and/or have had their slides made available. CON3108: Am I Reading Garbage Logs Correctly? CON3118: Don't Dump the Thread Dumps! JavaOne 2017 will be October 1-5, 2017. JavaOne 2016: "Java 9 will be coming soon — but not as soon as you'd probably hoped"
Taking the pulse of JavaOne: "Best one so far"